Singing, friendship and good times are the reasons our members join and stay with the organization. Sweet Adelines sing a combination of upbeat songs and ballads, a refreshing alternative to classical music. If you are, or have been, (or never have been) a member of a choir, Sweet Adelines will be a lively and energetic experience for you. If you wish, you can get involved with performing and competitions, which add excitement and challenge to your musical experience. Many members find their own personal development a thrill, and their self-confidence grows as they learn singing and skills they may never have known before. What kind of music do Sweet Adelines sing? Sweet Adelines choruses and quartets perform four-part a cappella harmony, barbershop style. This style of music lends itself to songs from any era – today’s ballads, popular show tunes, even jazz. 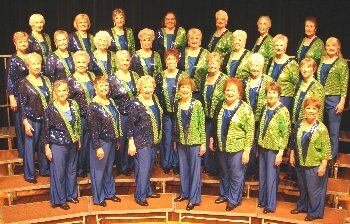 Sweet Adelines have performed their unique style of music in a number of popular venues from professional sports stadiums, Olympic ceremonies, with major symphonies, and even on several popular television shows. Where are Sweet Adelines International choruses located? Sweet Adelines International is a musical force in the United States and throughout the world. The international membership of nearly 27,000 women, all singing in English, includes choruses in most of the fifty United States, as well as Australia, Canada, England, Finland, Germany, Ireland, Japan, New Zealand, Scotland, Sweden and the Netherlands. There are prospective choruses in Denmark, Greece and United Arab Emirates. With more than 600 chapters in five continents, there is sure to be a chapter near you.